Connestee Falls has several parts. The top portion features a wide free-fall and nearly vertical cascade, with a smaller series of splashing cascades below it. 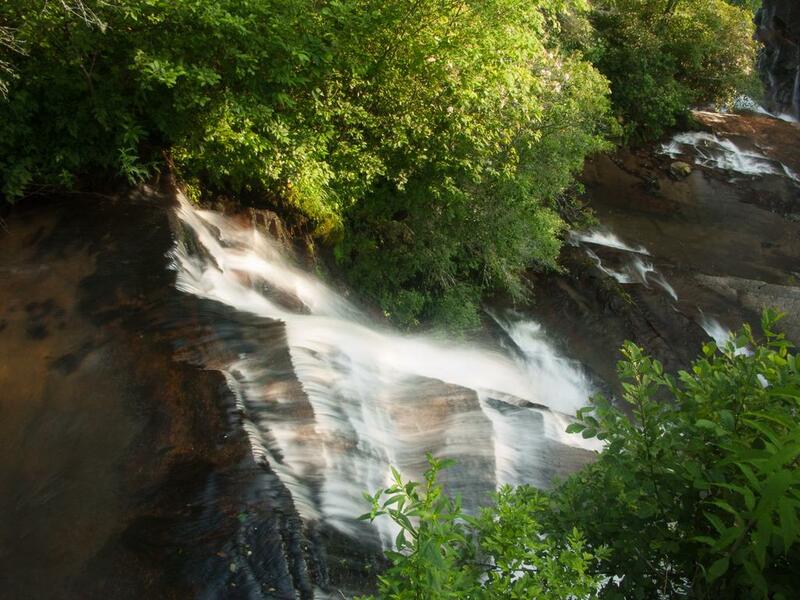 The bottom portion comes together with Batson Creek Falls, which is on a side stream, and then drops into a narrow rock crevice known as the "Silver Slip" and out of sight. The falls can be very photogenic, but since the new county park was created, you can't get to the best vantage point for shooting, which is the exposed rocks at the middle of the falls. A view from there is shown in the photo on the County's own web site, but a NO TRESPASSING sign prohibits you from leaving the rigid safety of the viewing platform and going down to that view. You'll have to get extremely creative and lucky here to make a good photo. About all you're going to get (legally) is a a distorted view of the falls below you, and a view of the adjacent Batson Creek Falls partially obscured by tree branches from afar, with a few cascades below the main part of Connnestee Falls in between that and the top of the Silver Slip. It's pretty, and the view down the little gorge is nice even by itself, but it just leaves something to be desired. A paved ramp leads to a level and sturdy concrete, wood, and steel boardwalk structure. This leads to an observation deck at the top of the falls, a total walk of about 200 ft. It's completely safe, kid friendly and ADA-accessible, so you should definitely stop if you're in the area. The waterfall directly below the observation platform is Connestee Falls.